Dussehra or Vijayadashami is a festival of Hindu religion which is celebrated as a victory of Lord Rama over Demon Ravana. 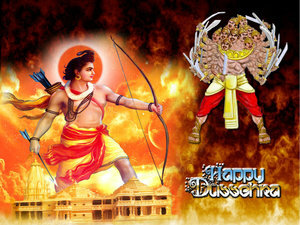 Dussehra is a very popular festival celebrated in all over India. This festival is also known as Vijayadashami. It is a cultural festival of great importance and significance. Vijayadashmi is made from two words "Vijaya" and "Dashami". "Vijay" means Victory and "Dashmi" means tenth day. It is believed that Lord Ram killed Demon Ravan on this day and rescued his abducted wife Sita. So, this day is celebrated in the memory of the great victory of Ram over Ravan. It is known as the victory of good over evil. There after his great triumph is celebrated in all over India on this day. In northern part of India, huge effigies of Ravan, his giant brother Kumbhkaran, and his son Meghnath are placed in an open ground. Fireworks and crackers are placed inside the effigies and at the end of the evening they are lighted by actors dressed as Ram and Laxman. Dussehra is a 10 days celebration, the nine days of Navratri and the tenth day is Vijayadashmi. The nine days of Navratri are classified as per the three basic qualities. Tamas: These are the first three days. The goddess of Tamas is fierce, like Durga and Kali. Rajas: The next three days are the days of Rajas. These days are related to goddess Laxmi (gentle and material oriented goddess). Sattva: These are the last three days. These days are related to knowledge and enlightenment. The goddess of Sattva is Saraswati. The last day is known as Vijayadashmi and on this day huge effigies of Ravan, his giant brother Kumbhkaran, and his son Meghnath are placed in an open ground. Fireworks and crackers are placed inside the effigies and at the end of the evening they are lighted by actors dressed as Ram and Laxman. Dussehra is a very popular festival amongst children. It is celebrated with great enthusiasm and joy. Many people organize special prayer meetings and food offerings to the God at home or in temples. They also attend great fairs (Mela) with their family and children where effigies of Ravan, Kumbhkaran and Meghnath are placed. The effigies are burnt on bonefire in the evening. There are some local celebrations that can last for up to 10 days. In Mysore, a large festival is celebrated of goddess Chamundeshwari. Special dishes of flat bread and potatoes are prepared in Bengal. The Vijayadashmi has very much importance on human life. It specifies the triumph of good over evil. It teaches us to follow the morals of Lord Ram. It explains the power of goodness and humanity is above all kinds of power. It also encourage the people who believe that whenever there will be chaos in the society and evil will try to take over humanity, God will appear in a the form of savior to protect his devotees. It is public holiday in India. Government offices, schools and colleges, banks are closed in India on Dussehra. The number of holidays can be changed according to states. It may be 3 days to an entire week.